London: Allison & Busby, 2005. This is the UK hardcover edition of Skeleton Man, published in 2005 by Allison & Busby, London, England. The dust jacket is white, with a desert landscape photograph along the bottom featuring a dirt road and the rear of a 1980s model Toyota Camry in the foreground. The publisher's logo, author name, and book title are printed horizontally on the spine. 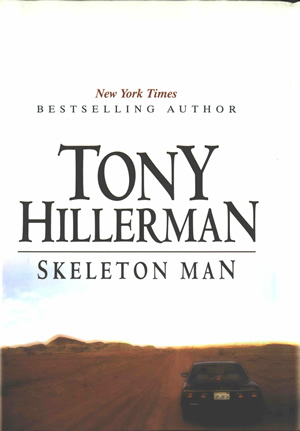 The back cover features praise for Tony Hillerman as the landscape photograph wraps around from the front cover, overlaid with the publisher's logo and barcode. Binding: Black cloth-covered boards with publisher logo, author, and title printed in gold on the spine.